Thoroughbred Adoption Network has a new website sponsor! 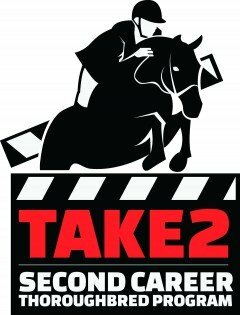 TAKE2 Second Career Thoroughbred Program Inc. was created to promote second careers for retired Thoroughbred racehorses as hunters and jumpers. Supported by members of the racing and breeding industries, the program rewards those who compete on Thoroughbreds with awards and prize money in restricted classes and divisions at horse shows across the country, and highlights the success of the Thoroughbred in the sport horse world. TAKE2 classes are offered at more than 300 horse shows in 23 states. We are grateful to Take2 for helping to support our effort!